It is time for a change of scene again. I have selected a new image as a background picture, one which brings a set of warming associations. 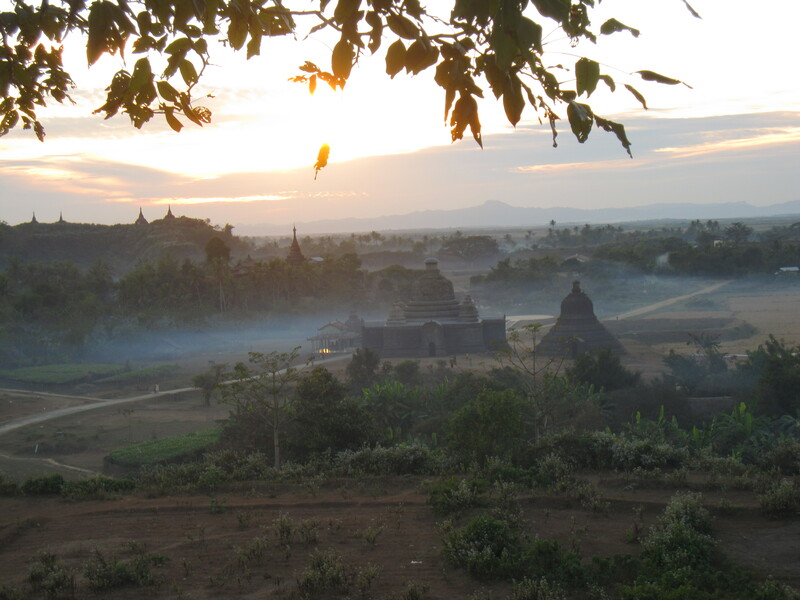 This brings memories of the adventure I embarked on, visiting Mrauk U at Christmas 2011. Memories of another stepping stone moving forward, regaining confidence and travelling alone to a place I had long wanted to visit. The story and pictures of this adventure are to be found in a few write-ups, and the overview with all links is all to be found here. 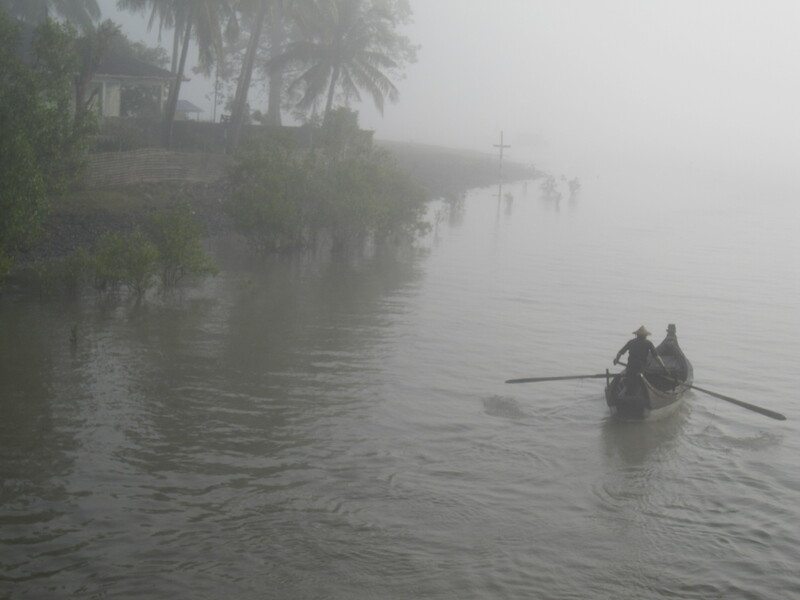 I have selected this particular picture, taken as our boat was pulling out of Sittwe shrouded in mist, because I feel it captures the emotion, the mystery and the anticipation of the whole adventure. As I have told the story in three parts, along with photos on the sister blog, I thought it useful to put these together so that it is possible to see the complete picture. 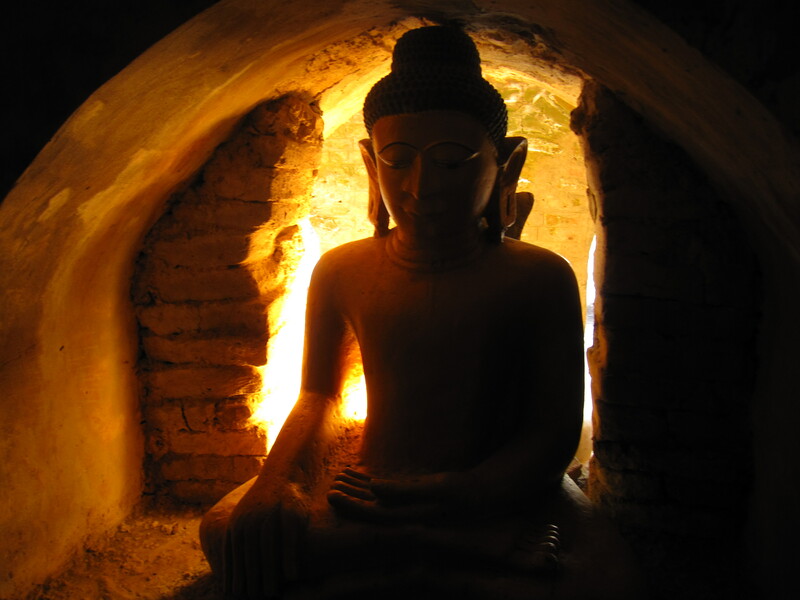 Leaving you with another favourite image – a chameleon sitting on the shoulder of Buddha. Trying to be just like Buddha? 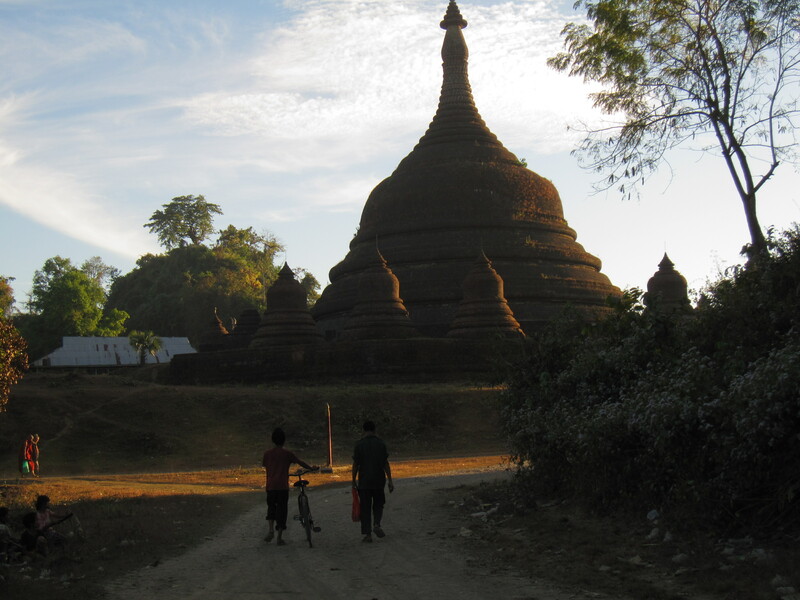 Mrauk U is much much quieter than the more accessible and better known Bagan. However, the quiet was occasionally punctuated by the arrival of one of the ubiquitous “light trucks” which carry so many people. These were transporting large groups of school students around the temples, and many of them had loud modern music blaring from speakers adding to the air of festivity of these groups. In the temple I had found a beautiful spot, giving a panoramic view of Mrauk U and sat down to watch the scene peacefully. Deep in thought, I hadn’t noticed one of these trucks arriving. The first thing I noticed was a stream of school students as they poured through the temple seeping out through the various exits and passageways. And all making their way towards me. Within moments I was surrounded by a cheerful, animated and enthusiastic group, asking me my name, where I come from and giggling at my responses. They were eager to practise their English, but I am not sure how useful it is with my Scottish accent. We all laughed together and before long they headed back to their van, to make their way to the next temple on their list. Suddenly it was again very quiet. Trying to make sense of the map, I used the quiet time also to plot my vague direction of exploration and before long headed off towards another group of temples. On the way back, with the sun nearing the end of its day’s work in our part of the world, I found a little track up to a vantage point on the top of a small hill. I scrambled through some scrub, on a dried mud path, very glad that this is not rainy season and arrived at a clearing where I stayed to watch the sun set, the mist form and the evening rituals, activities and tasks taking place before me. On my way back, I stopped off at a little stall selling coconuts and spent a peaceful interlude, sipping at was to become my daily evening cocktail (coconut water) and watching what was going on around me. Back at the hotel, after a delicious Rakhine tomatoey fish curry, I tried to phone home to say I had arrived safely and all was well. The guide book had told me that there are only five phone lines to the town and with over 250 subscribers getting a line out is not easy. After numerous unsuccessful attempts I headed back to my room, to settle down for the night. My room was well equipped, and in addition to the hat and glow in the dark stars it had a well stocked fridge (no Andaman beer this time though) and a TV. However there was only one channel and that was the one which the staff were watching in the dining room! It switched from Star Movies to ESPN sports and on to Korean soap operas without warning, to my great amusement. I watched part of “Spy Next Door” before it switched to a football match which gave me a good excuse to read. The other great surprise which my room held was also revealed to me just before dinner. I wanted to wash the dust off my feet and turned on the tap in the bathtub, bracing for the usual chill of water. Within seconds though, the water from the tap was roasting hot to my utter delight as I realised that hot baths would be a further treat of my trip! How unfortunate that I hadn’t brought any bubble bath with me!! What a great way to round off a highly adventurous day! I slept fitfully, as is usual thanks to Tamoxifen, dreaming bizarrely of being unable to find my room in the rain, a strange dream considering this is the middle of dry season. I was also amused to hear gentle snoring from the room next door. Until I realised that if I could hear gentle snores, my neighbour would surely be able to hear my not so gentle snores! There were few signs of Christmas as I started my day, and after a nice breakfast, I set off to explore more widely. For the day, I had hired a bicycle so that I could get a bit further. The day was unusually cloudy, but given how hot it can become in the daytime in dry season, this was perfect weather for cycling! I had a look at the map, and headed off with little idea of where I was going or what was in store. I followed a main track initially, and then just kept going, turning left or right along village lanes on the basis of what drew my interest and curiosity. Inevitably, after half an hour of what I thought might be a wide circuitous route, I was clearly very lost! I was near a monastery so I stopped, parked the bike and sat myself down beside the road on a grassy spot and consulted my map. The monastery was not marked and there was no other landmark to give me any clue as to where I was. What a glorious feeling! In no hurry to go anywhere, and able to just sit and soak in the sounds and activities around me I was in no hurry to move on. First I needed clarification of which direction the town was, either continuing on this road, or turning off one of the lanes nearby. As I looked up I saw three children heading towards me. As they approached, I realised that one of them was holding what looked like a very angry cat. This was no ordinary domestic tabby cat though, its ears were differently shaped and although it was the size of a cat, it was clearly a kitten of its species. 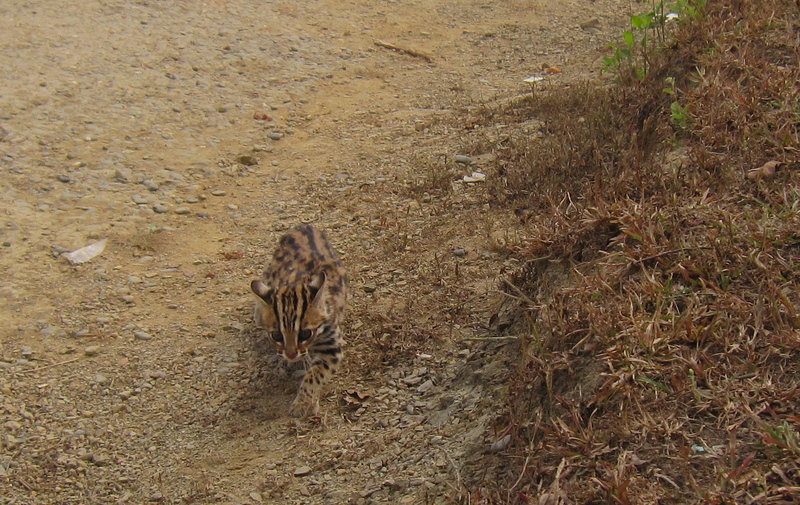 It was marked just like a little leopard and my first thought that this was in fact a leopard kitten. I quickly realised that was not possible, and took some pictures of it so I could find out later what this animal was. A monk approached, heading towards the monastery and was clearly not expecting to see a strange foreigner parked in the lane and he asked me my country. Then he asked me if I was a Buddhist. After my replies, I asked him which direction was the town and he pointed back to where I had come from. Off he headed to the monastery, and I brushed the dried grass off my trousers and got back on my bike. I continued to explore the back lanes, asking periodically the direction towards town. 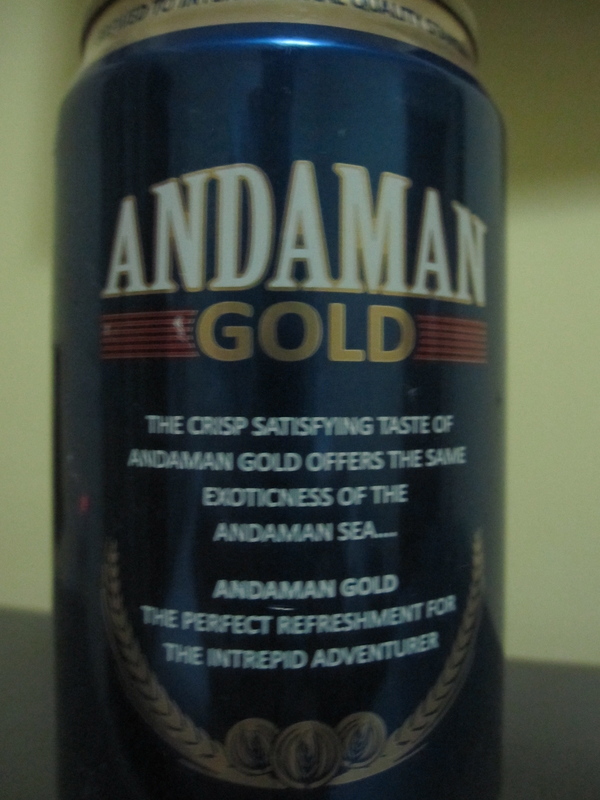 It was nearly 12 o’clock when I started recognising the shops near the hotel and stopped off at a roadside stall for a cold drink. I took advantage of this time to study the guide book map. There were only 2 eateries mentioned in the book and I had already eaten in one. The other was described as being in a teak house and sounded nice so I decided to set off and find it. Easier said than done. The map was rather confusing and I found myself repeatedly heading down the same road which was clearly not the right one, but persistently failed to find it! So I started turning off down different roads, and keeping an eye out for somewhere for my Christmas lunch, preferably the Restaurant cutely named “For You”. Before long, passing along yet another new road, I caught sight of a little place and saw the name “For You”! Success! It was beside a couple of parked buses and small stalls selling bus tickets so was in a rather noisy spot but that didn’t trouble me. I went in, and was surprised that there was no one else there. Ready to leave, a woman came up to me and I asked her if they were serving meals. Of course they were, she smiled, and what would I like? With no sign of a menu I asked for fish – the Rakhine staple and within minutes it was being served up, piping hot and smelling delicious. And it was. Simple, and utterly delicious. Once I had finished I headed back to the hotel as one of the brakes on the bike had stopped working, leaving the one which was working on the Twang Arm side which was not so easy to use. I took advantage of the time to consult the guide book again, and look at the maps. It soon became very clear that the orientation of the map was rather different to the orientation of the actual town and the “For You” listed was nowhere near the bus park! Another mystery which I resolved to solve at some point! 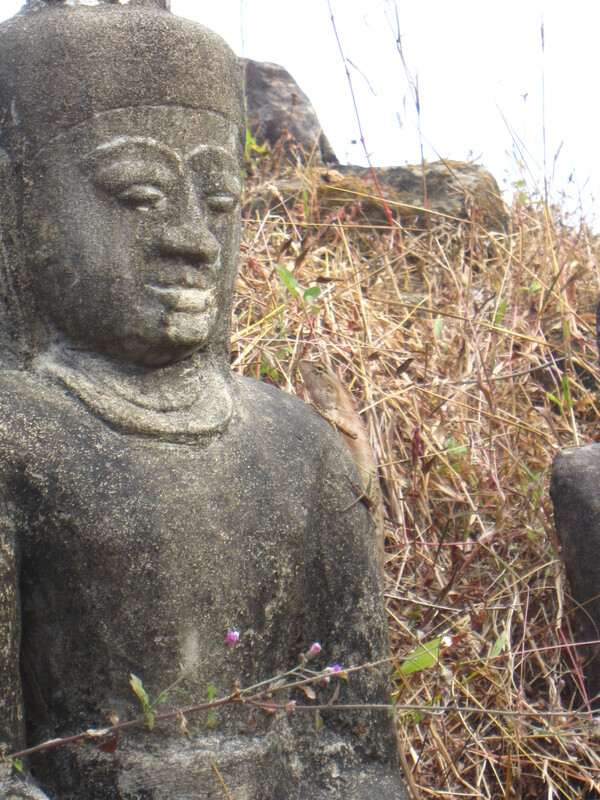 I the afternoon I headed off in a different direction, aiming to find a group of temples in the north eastern area of Mrauk U, especially seeking to visit a small hill temple called Pi Sei. Following my nose, and asking directions at every temple on the way I soon found myself carrying the bike along a rough, steep and narrow trail. 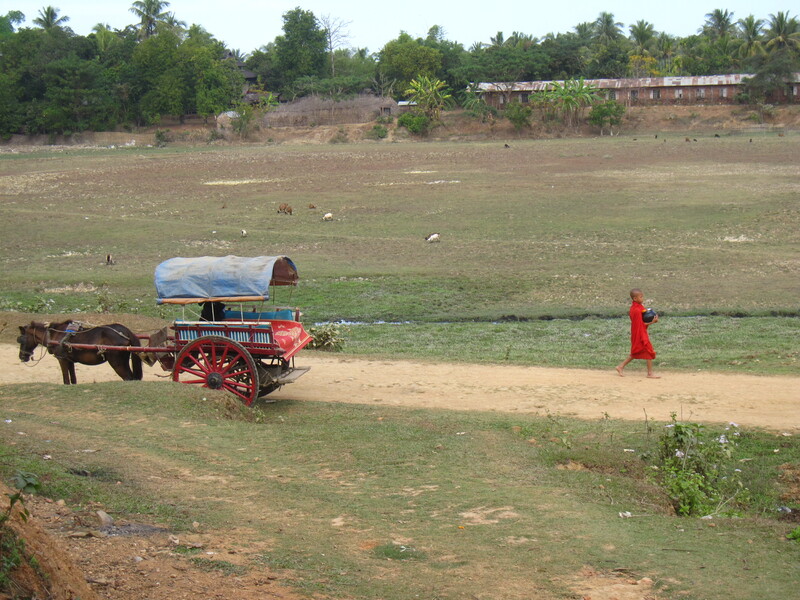 It eventually brought me out on a main road, busy with women carrying wood, bullock carts heading home, children playing, women carrying a variety of goods on their heads, villagers carrying water, young men playing chinlon (like “keepie uppie with a small woven bamboo ball) and monks walking along barefoot. With all the spontaneous diversions it took me rather longer than I realised to get to the northern temples. The sun was by this time sinking quite rapidly and I did not want to be lost in the dark. Lost in the daytime is fine but lost in the dark is a bit more scary and a step too far towards more extreme adventure! So reluctantly I turned back, deciding not to head back through the wooded track, and kept on the main road. Sure enough it eventually took me to the town and I was soon back at the hotel parting company with my trusty bike! I wandered round in the dusk to the coconut stall and slowly sipped my coconut cocktail, watching the sky turn various shades of dark purple thanks to the cloudy sky. Soon I was back in my room, pouring my second hot bath of the day, before heading to the restaurant for Christmas Dinner of fish curry! I had decided to hire a tonga, or pony cart for the day so that I could explore the more distant temples, including the ones I had not reached the day before, and to minimise the “getting lost” time. I also made arrangements for a visit to the tribal villages for the following day, so that arrangements were in place in plenty of time. After breakfast, the hotel manager rold me that my chariot was awating, in the form of her father, with his pony and tonga. I told him which areas I was keen to see and we set off, with me rattling around the back of the tonga. It was again cloudy and overcast, but dry and not cold. Firstly we visited the Kothaung and Pi Sei temples and I spent a good bit of time exploring. Pi Sei is a small, overgrown hilltop shrine with four Buddha figures (facing north, south, east and west) and with a single Buddha figure on the top, visible from afar. I loved this little temple, and spent quite a while exploring, taking photos, contemplating and enjoying the 360° view. I enjoyed the solitude and peace, and as I was coming down the hill, I met another tourist on his way up. That is how busy it was! We chatted briefly before heading off in different directions. I spent a marvellous day, ambling through the villages, from temple to temple, climbing and clambering among ruins, walking respectfully and silently barefoot in larger temples, and all the while taking a ridiculous number of photographs. It was as I clambered up a steep and overgrown path towards a rarely visited hilltop set of temples that I suddenly remembered how much I had been dreading Christmas. It was almost dark when I returned to the hotel, and parted company with my gentle and kind guides for the day, man and pony. There was just enough time for me to head round for my daily coconut water. Outside the temple, beside the coconut stall one of the pickups was parked, music blaring. Well actually, although I have quite a liberal and broad minded appreciation of music I am not sure that I would actually call it music. There was a thumping bass, and a screeching voice yelling out expletive after expletive. And not little mild swearie words, but the Big Naughty ones!! The students on this truck had the same enthusiastic smiles, and youthful exuberance but these were sporting extravagant mohawk and punk style hair styles along with black and purple make up! It was an innocent and incongruous sight as they piled out of their truck and bounded up the temple steps, the swear words continuing to blast forth from the truck! It was all part and parcel of everything going around me, which I absorbed along with the delicious nutrients in the coconut water, reflecting on a magical day. As well as reflecting, I could also feel a nervous flutter as I had made a Big Plan for the following day. If that went as hoped, I would be visiting remote villages and meeting some very special women. That account needs its own space and that will be the third and final part of the adventure! I had enjoyed my adventure at Angkor in Cambodia this year enormously and found that it it boosted my post diagnosis confidence enormously. From the wheelchair days transiting Bangkok airport, I was off with a travel bag and exploring on my own. I have to say though, that if I am very honest, a break in Cambodia is perfect for boosting that confidence because it is neither physically nor logistically too challenging. You get on a flight, land in Siem Reap, waltz through immigration handing over your passport and pics in return for a full page visa, and then head out into the daylight catch a tuk tuk to your hotel and get ready to explore. Gentle yet exciting. 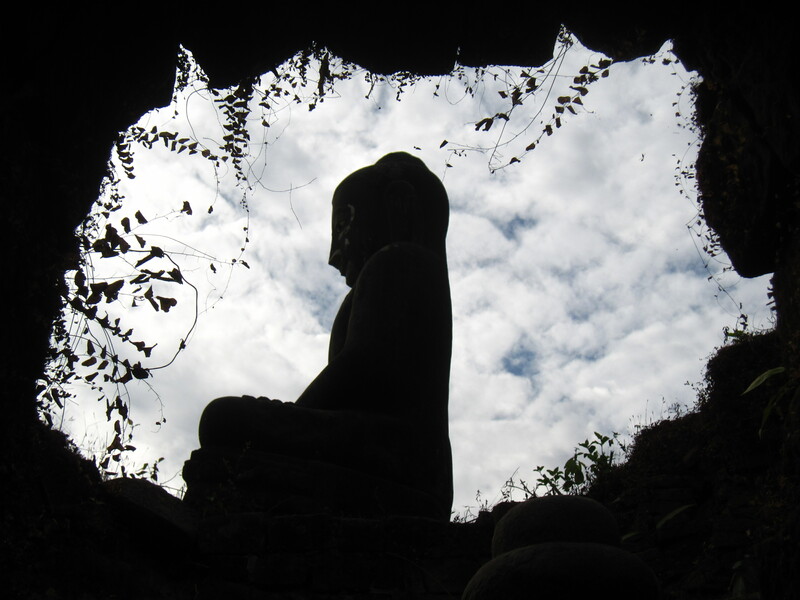 My adventure to Mrauk U was a much more demanding trip. The journey was more complicated and physically demanding and the area far less touristed. I was travelling alone (through choice). And I was quite nervous about the whole adventure. 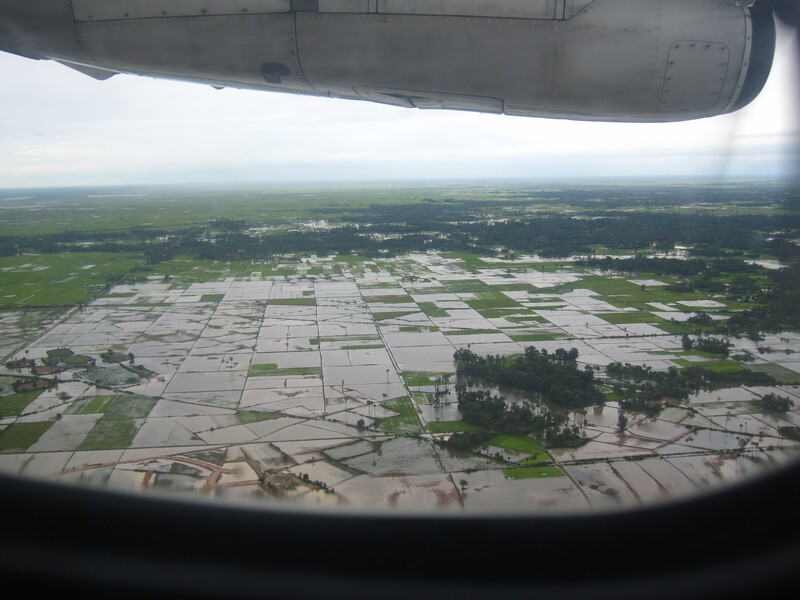 On 23 December, I had an afternoon flight to Sittwe. The timing was very welcome as I had been working up until the previous day and this enabled me to spend the morning packing and running out for last minute essentials such as mosquito repellent and loud toe nail varnish! Finally, I put the last essentials in my bag, switched off the fan, closed my lap top ready to head off line and upcountry for a week. After check in I had a moment of excitement when I saw that the café in the domestic lounge advertised that was an internet café, but that was short lasted and I learned that there was no internet in fact, but a set of three sleeping computers. It took me a few moments pondering why the café used a picture of a washing machine on its signage. Only to realise that it was actually an aerial picture of a coffee cup! 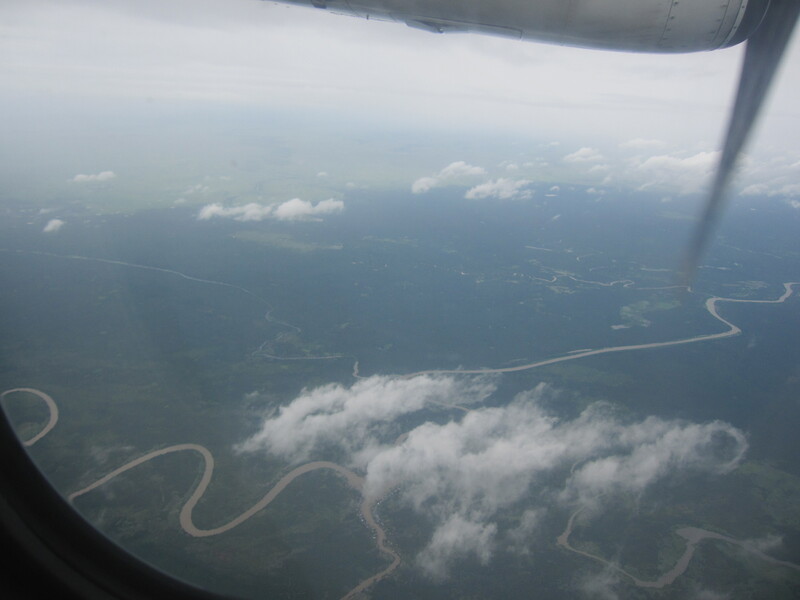 My flight to Sittwe was straightforward and on time. I was amused that the passenger in front of me had among his carry on baggage, a pair of fairy wings. I hadn’t realised that we needed to bring our own wings to fly on this airline! The flight landed as the sun was sinking in the late afternoon. 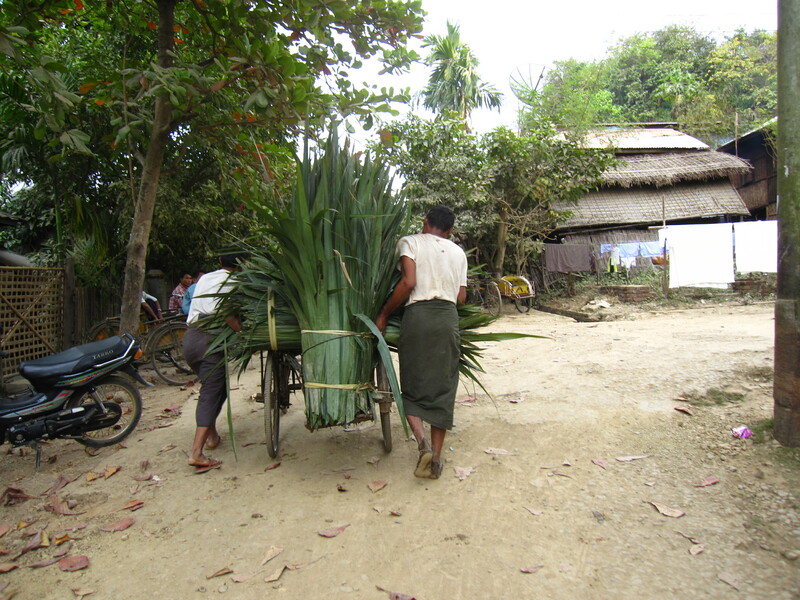 I booked into the hotel, arranged my early morning transfer to the jetty and then headed out to explore Sittwe town. I managed to get really lost, and eventually had to ask directions to get back to the main street and the hotel. 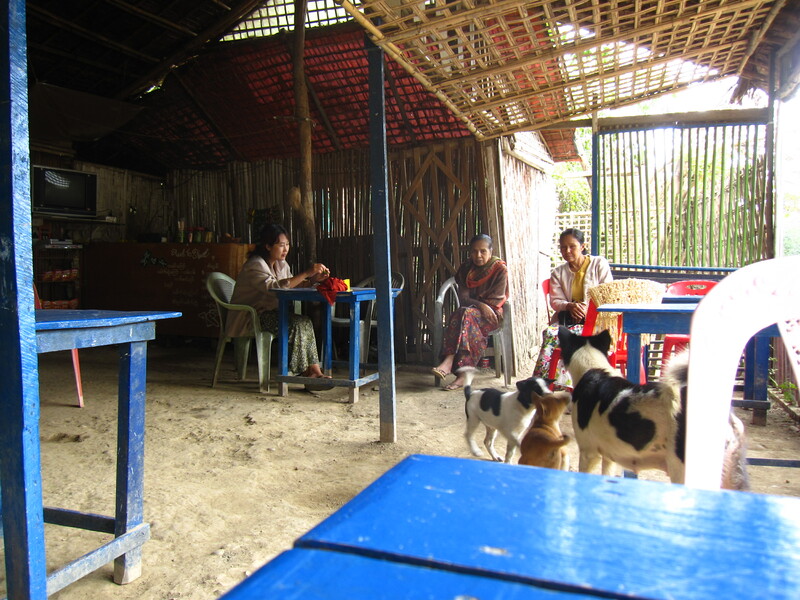 And promptly went right back out again, to find somewhere to eat the famous Rakhine sea food. I managed to get back safely, and despite being tempted by “adventurer lager” in the fridge, I turned in early as I had to be up long before sunrise to catch the early morning boat to Mrauk U.
I did not sleep too well, anxious not to oversleep and miss my boat, and just after 5 am I was getting myself ready to check out and head to the jetty. I had been looking forward to the sunrise journey but the morning was very very misty and dank. Not typical winter season weather at all so still very dark. Speeding through the damp streets on a motorbike tuk tuk I was chilled but soon arrived at the jetty. The boat was waiting, and my first major challenge materialised in the mist in front of me. I am used to getting on and off boats in Myanmar, and have boarded by a variety of different types of access – from sturdy bridges to flimsy thin planks. I have given up on pride and accept help now if I am not too confident about the access. 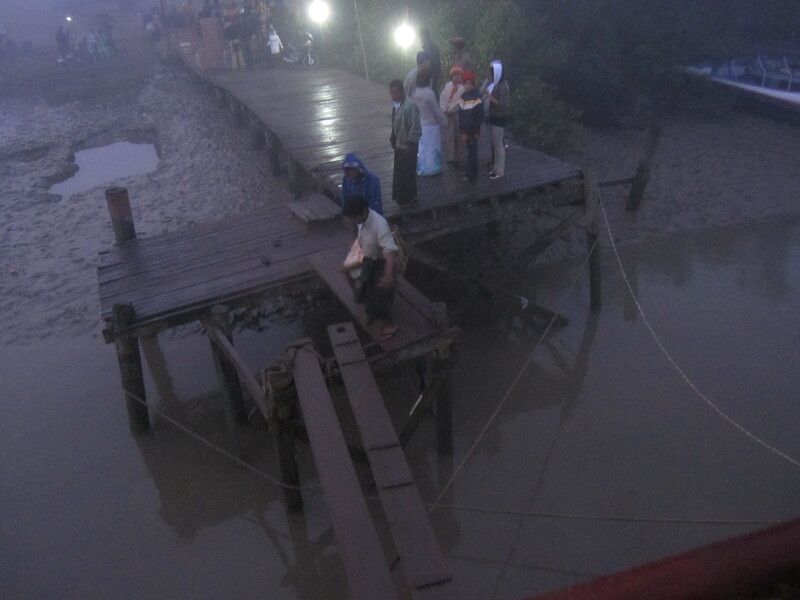 So catching sight of a narrow pair of planks, slippery in the mist and carrying my travel bag and supplies, I hovered briefly at the edge of the plank before one of the boatmen took pity on me grabbed my hand. Within moments I was safely across and on the boat. Ready for five hours of upriver cruising before I had to worry about how on earth I would get off the boat at the other end! 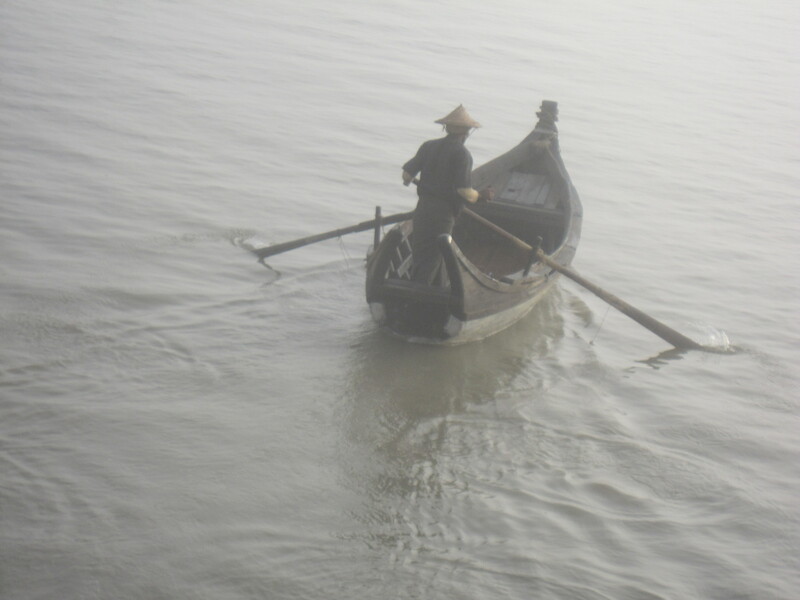 Our departure was delayed due to the thick mist and we watched as the early morning river activities took place around us, small wooden boats appearing through the mist bringing people from neighbouring villages and returning with goods and fish from the morning market. Figures shrouded in thick shawls and even the occasional soul wearing a Santa Claus hat to protect from the cold damp air. Eventually, the boat hooted, the boat men leapt into action unravelling the ropes, disconnecting the electric cable from the boat which had lit up the jetty, and removing the planks and we moved away from the Sittwe jetty. I had been on the boat over an hour and finally I was heading somewhere. As we travelled upriver, the mist slowly lifted, revealing eerie images on the river and along its banks. The broad estuary gradually narrowed as we wove our way inland, along a complicated network of waterways. 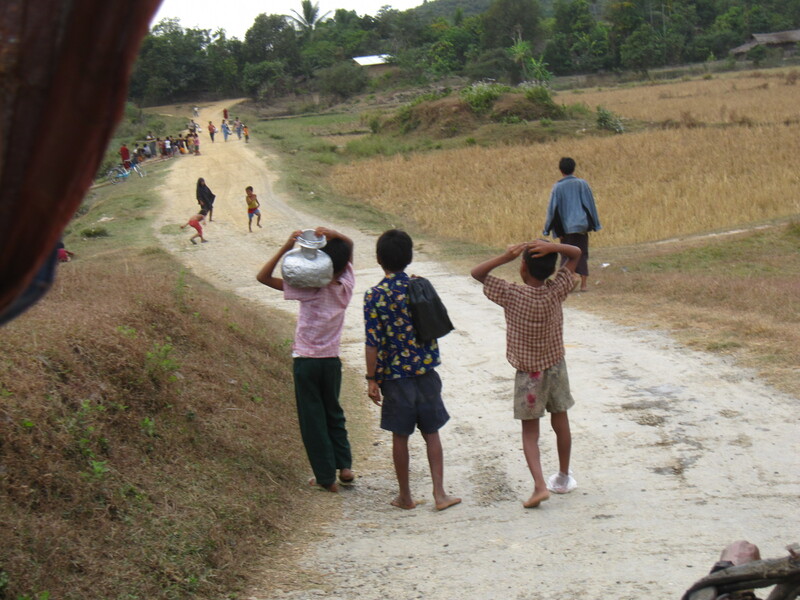 By lunchtime, there was a distinct change in the atmosphere on board as local passengers started to gather their belongings, and prepared themselves for arrival in Mrauk U. The hilly area in the distance, gradually came closer and soon it was possible to spot a few temples on the hilltops. A crowd was gathered at the jetty, bicycle side car trishaws, bicycles, motorbikes and a few motorcycle tuk tuks and their drivers anxious to transport the passengers to their onward destination. I had been on the upper deck and the ladder to get there was almost vertical not to mention extremely narrow. So manoeuvring myself, with my travel bags in my good hand and Twang Arm being used to stabilise my steps, I managed to get myself to the exit. Where I was met with a plank which was slightly less narrow, and this time dry, but steep due to the water being high. I dithered for a moment, and again one of the boat staff grabbed my hand and I quickly bounced along the plank and onto the dry land of Mrauk U. I negotiated a trishaw to the hotel and within half an hour was unpacking my bags in a room with stick on “glow in the dark” stars arranged in the Great Bear formation on a deep blue ceiling. The wardrobe had the essentials, a dressing gown, a spare blanket, a hair dryer and a bamboo hat to protect from rain or sun, which ever is prevalent at the time! I quickly settled into the room which was to be my home for the next five nights. Eager to see the ancient temple city and its surrounds, I picked up my little backpack, hat, guide book and note book and headed off into the town to find some lunch to fortify myself for some serious exploring. And that story will be in Part 2! This year it has actually been really hard to settle on my three words to guide and inspire me in the coming year. To be fair, I knew it would be difficult because I have liked my previous choices so much. Not only have they been the right words for me, they have been the right words for me in that particular year. When I first saw the idea of selecting three words at the end of 2009, it spoke so clearly to me and the three words came almost instantly. 2010 was indeed a year of recovery, discovery and laughter as I moved through the months of heavy treatment, back to Scotland to see family and friends after so long, returning to work and finally growing those characteristic grey chemo curls as I moved towards the end of the year. Last year’s words clearly represented a shift in where I was with “harmony, vitality and adventure”. Harmony in terms balance in my life, professionally, personally, emotionally and physically as well as harmonious musically. Vitality encouraged me and spurred me on to build on my daily swimming and be even more active, taking up the gym and becoming fitter than I probably have been in decades. And adventure – well, this has been a favourite and I hav embarked on a number of adventures throughout the year, which have grown in their adventurousness as the year progressed! So I started thinking about the words for 2012 over a month ago, looking forward to the process of selecting the words as much as I look forward to a new series of the Amazing Race! As the time approached I would start thinking of the overall areas I want to focus on and pick up on words as I heard them, read them or even as they came to mind as I was ploughing up and down the swimming pool. Resilience comes first. This is one which I have leaned increasingly towards as the challenges of the past weeks played out, and the pain I experienced. It expresses the priority I aim to place on building my strength both physically and mentally so that I am in a better place to deal with whatever might come my way. The past weeks showed me that despite my pretty good health, both the cancer itself, and its treatment (combination of chemo, the radical surgery, radiation and the calcium-stripping Tamoxifen bonus side effect) have led to a fragility which I have to recognise and respect. So I intend to continue to build my strength physically, with my precious swimming, and the less popular but equally important regular gym visits and other healthy pursuits. Mentally and emotionally I will continue to prioritise my creative time and take control of what is in my hands. This year has seen me join a creative writing group and latterly a Book Club which have been lovely ways of connecting with likeminded souls here, as well as an inspiring way to spend free time. These are ways of building my strength and capacity to make me more able to “bounce back” following whatever unexpecteds and unwelcomes head my way. The dictionary definition of resilience is 1) the capability of a strained body to recover its size and shape after deformation caused especially by compressive stress and 2) an ability to recover from or adjust easily to misfortune or change. There is also a very interesting discussion on psychological resilience on Wikipedia which tells us that “Resilience has been shown to be more than just the capacity of individuals to cope well under adversity. 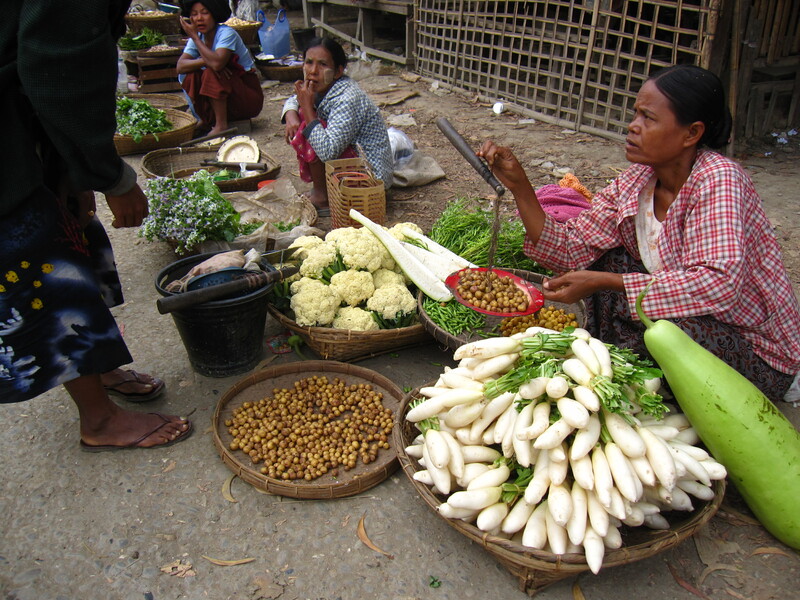 Resilience is better understood as the opportunity and capacity of individuals to navigate their way to psychological, social, cultural, and physical resources that may sustain their well-being, and their opportunity and capacity individually and collectively to negotiate for these resources to be provided and experienced in culturally meaningful ways”. How apt. My second word is escapade. I toyed with coining my own noun “escapaderie” to describe the broad concept of being involved in escapades but decided that was just a bit too inane! An important word for in 2011 has been adventure. I have referred repeatedly to adventures, made field trips and short breaks into adventures and plotted adventures. These have all represented a shift in strength, confidence and independence. Two years ago I was unable to walk unaided through Bangkok Airport. 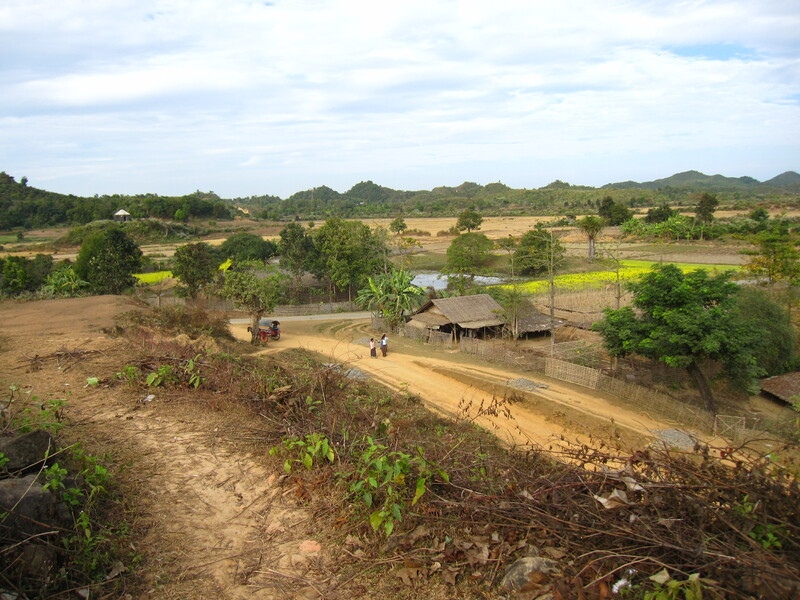 Two days ago I returned from a fairly physically demanding trip to a remote part of the country, involving local flights, side car/trishaw transfers, exploring by cycle, pony and on foot and long boat trips which I had to board by slithery narrow planks! It was a my Mrauk U adventure and pushed me further than I could have imagined possible at the beginning of even this year. 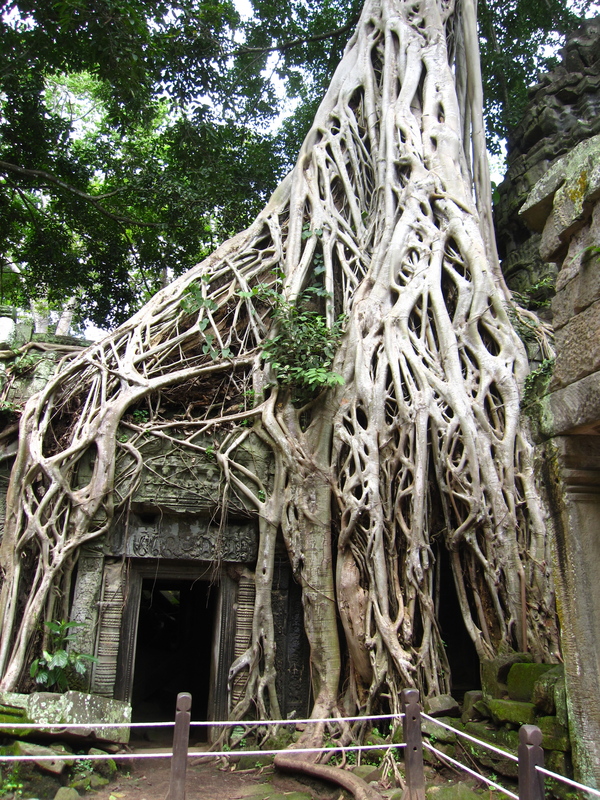 My 2011 adventures have included remote field trips to North Shan and the Ayerawaddy Delta, a trip to Chiang Mai by overnight train and my somewhat extravagant birthday trip to the temples of Angkor in Cambodia. In choosing “escapade” I wanted to maintain that sense of making the most of experiences, reaching out for the new and continuing to push myself. For me though, escapade also has a touch of naughtiness about it which appeals to the rebel in me! This is confirmed by the definition I found of escapade – “a usually adventurous action that runs counter to approved or conventional conduct”. What appeals additionally to me is that an escapade (in my world) can be as small as an almost imperceptible gesture through to a grand action which attracts attention. I can apply escapade to so many actions, even to the way my friend and I behave in the oncology waiting room together, being naughty cancer rebels and giggling about the grief we are going to give our doctors in the form of never ending questions! And my third word, wonder, came to me in the swimming pool as I was ploughing northwards and southwards, waiting for the sun to rise. Again this has a variety of meanings. As a verb it encapsulates the action of questioning and enquiring, descriptive of my inquisitive soul as well as critical to my work. And there is never a shortage of things to wonder about! As a noun, it is that almost innocent sense of being in awe of things from the most simple through to the truly breath taking and grand. Throughout 2012 this will remind me to retain that sense of appreciation in what is around me as well as honing my natural curiosity. As in the two previous years, I am ridiculously pleased with my words. They fill me with optimism for the coming year and the sense that I can take control of what is in my own hands. And that is another reminder that much as we cannot change many things which happen to us, particularly in the land post cancer diagnosis, there are many ways to shape our life and experience which are in our hands. Only we can grasp those ourselves and we have the capacity to interpret what is around us accordingly. And that is why I have chosen the image below. A doorway into an unknown place, dark and frightening. It is also an image which gives me goosebumps of exhilaration as it reminds me of the emotions and new found confidence I felt when exploring the ancient and mysterious temples of Angkor earlier this year. I wish you a 2012 which is as kind as it can be, and for continued strength and resilience from within each of us as well as from each other. I returned last night from my trip to Mrauk U and Rakhine State, with a few additional treasures which I had not taken with me – including my camera and its 700+ new photos, a travel bag full of muddy, dirty washing, several bruises thanks to a day cycling, a book about the temples and history of the area, a necklace made by women in the Chin villages I visited and a roughly hand carved sandstone Buddha figure. A week offline is a long time, especially when the connection is so poor, so catching up and posting photos is taking more time than I would wish. So here is a taste of my Christmas adventure while the details are on their way. When I chose these as my guiding words for the year, I didn’t realise how often I would refer to them. And here I go again! My visit to the UK was over in a flash, and although I managed to get around the country and see my family, there was little time for reflection or relaxation. I know that is the deal though, I have been overseas long enough to know that home leave is home leave and not a holiday. The special time with family and friends is accompanied by a crazy logistics-fest to get around the country and spend time with people. I also find that the backlog of various tasks such as bank stuff, correspondence, immunisations, hair colouring (note how I just slipped that in there – oh yes, that is a subject for its own post), phone conversations and stocking up on various essentials and goodies which I can’t get my hands on is always takes far more time consuming than I realise. Every year! This time my visit was shorter, and I was sad that I was not able to connect with many special people. However, this year was different to the general home leave schedule. Two years ago I did not manage to get back on home leave, for a number of reasons. The biggest one being the unplanned encounter with Breast Cancer. Nuff said! Last year, my visit was at the end of the treatment and for the first time I did not even attempt to get around the country as much as I usually do and spent a good bit of time on a remote Scottish island. Looking back, I realise how frail I was and how “cancery” I probably looked. Being bald helped that image. So this year has been very different. Having my checks just before the visit gave me a wonderful peace of mind before travelling. I also felt confident about travelling on my own. In fact the main challenges I have found have been relatively minor. There is the continual “faulty thermostat” issue – being too hot, then too cold, then too hot again (repeat ad infinitum….) and the yucky crumbly nails. The faulty thermostat is no different in cooler climes I have discovered. I just have more layers to remove and replace and often in more crowded spaces! I think the nails have probably been affected by the travelling – carrying bags, and putting my hands into handbags for passport, purse etc has resulted in 8 of my nails being quite badly damaged. That is 8 of my fingernails, and not including toenails, so quite a high proportion! One thumbnail has been particularly damaged and tore off eventually far enough down to cause bleeding. Not nice. I am not sure whether this is still the after effects of chemo, effects from Tamoxifen or both. In any case, when you add the travelling factor, it has resulted in quite a combo. 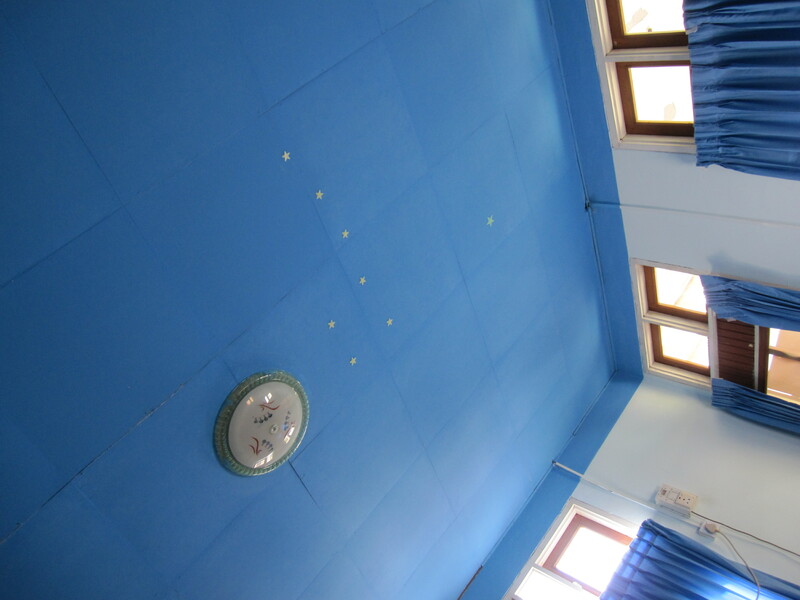 So I flew back to Bangkok on Friday/Saturday and when I woke up this morning I had absolutely no idea where I was, what day of the week it was and what time of night or day it might be. Slowly it came to me that I am in Siem Reap, Cambodia, for the first time in my life. Despite living in the region for many years, and having had a fascination to come here, I have never quite got here. Till now. I am in that beautiful phase of “anticipation” now with a new place to explore and discover. Planning for and anticipating the coming days for jungles and rainforest temples. Enjoying the harmony of these surroundings and the break. Feeling so much healthier and with a sense of real vitality. And embarking on another adventure!